Friday's launch of the first Falcon 9 rocket will not only be a shakedown of a brand new booster, it will test the fortitude of the space community at the dawn of an uncertain new chapter in human spaceflight. SpaceX leaders say the outcome of Friday's test launch of the Falcon 9 rocket, increasingly the face of the growing commercial space movement, should not be a bellwether for NASA's plans to turn over human spaceflight to private companies. Founded in 2002 by Elon Musk, an Internet and technology mogul, Space Exploration Technologies Corp. has become the most visible participant in the commercial space industry, even before the first launch of its largest rocket. Musk tried to lower expectations for the launch during a conference call with reporters Thursday. "My personal assessment of the likelihood of success is probably 70 to 80 percent," Musk said. "However, I should point out that is less than the probabity of success in Russian Roulette. Remember that scene from 'The Deer Hunter?' That's tomorrow, but not quite as likely." 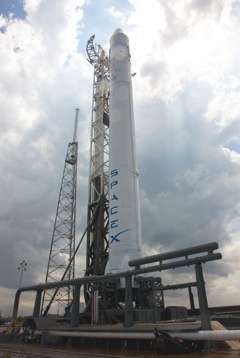 "This is very much a test flight of the Falcon 9," Musk said. "It's analogous to the beta testing of some new technology. The payload in this case is the structural test article of our Dragon spacecraft." Hundreds of sensors on the rocket will collect data on the vehicle's flight performance. SpaceX says it will measure success by how much information engineers learn from the flight. "You can break that down into first stage propulsion, structures, thermal, avionics, the guidance," Musk said. "Then you move to the upper stage. Do the two stages separate correctly, does the upper stage start, does it acquire its target vector, does the guidance, navigation software and electronics work? How does it perform in vacuum? How does it perform in the radiative environment of space?" 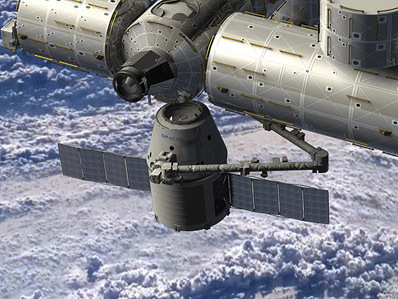 The Dragon is an unmanned cargo freighter NASA hopes will resupply the International Space Station beginning next year. NASA already awarded a $1.6 billion contract to SpaceX for up to 12 operational logistics flight to the station. Following Friday's demo launch, SpaceX plans up to three progressively more ambitious Dragon test flights on the Falcon 9 through next summer. "This launch is about testing the rocket," Musk said. "Flight 2 is about testing the Dragon spacecraft we're developing." 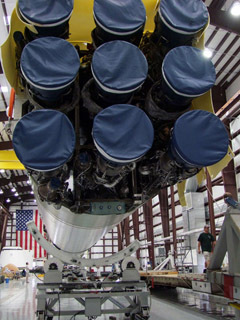 NASA officials will be closely watching the Falcon 9 launch, but the space agency will have no formal role in the program until the first Dragon test flight later this summer. "There's a reason this first flight isn't carrying up a Dragon capsule taking cargo to the station," said Mike Moses, director of shuttle integration at the Kennedy Space Center, said last week. "That's where we try not to put that pressure on them to say, 'Hey, you better get that right because the next one's carrying our stuff.'" SpaceX has scored back-to-back successes of its smaller Falcon 1 rocket, but there is a steep learning curve for the medium-class Falcon 9 booster, which uses five times more engines to get to orbit. Even if the flight doesn't go perfectly, the data returned from the rocket will let engineers know went wrong. "If you have a failure, and it's a very clean failure and you understand what it was and it was very obvious to you, you can repair that and then build a much better, robust design," said Bill Gerstenmaier, NASA's chief of space operations. "So it actually could benefit you." Musk said the second Falcon 9 rocket will ship to Florida soon, and its Dragon payload should be ready for flight in a month or two. During that mission, the Dragon capsule will orbit Earth for a few hours and parachute into the Pacific Ocean on a NASA-sponsored test flight called COTS 1. SpaceX wants to continue with the first Commercial Orbital Transportation Services flight in a few months, no matter the outcome of Friday's launch. "Elon knows he has the customers to have multiple launch attempts to get it right," said Bretton Alexander, president of the Commercial Spaceflight Federation. "He's confident enough to bite off a lot of test objectives on the first flight. You never know if that's the right strategy or not, but I guess we'll find out tomorrow." The 154-foot-tall rocket will blast off between 11 a.m. and 3 p.m. EDT from pad 40 at Cape Canaveral, if expected thunderstorms stay clear of the space center. There is a 40 percent chance cumulus and anvil clouds will violate weather rules. Musk says the rocket has been ready for launch for more than a month, after engineers tested a new adhesive for cork insulation on the Falcon 9's first stage. The Air Force and the Federal Aviation Administration wanted to ensure the Falcon 9's flight termination system would be ready to blow up rocket if it strays from a tight flight corridor during launch. Safety and regulatory officials signed off on the system Thursday, clearing the way for the Falcon 9 rocket's first launch attempt Friday. The 30-person launch team loaded propellant into the rocket for the first time in late February, and the booster fired its nine Merlin engines March 13 on the launch pad. "I'm trying not to get too emotional about anything," said Ken Bowersox, a former astronaut and SpaceX's vice president for astronaut safety and mission assurance. "I'm trying just to stay calm and think about all the preps we've been through and that we have left to complete. There is a lot of anticipation by all the people here at SpaceX. It's a really big launch for the company. We're trying not to let that excitement and anticipation bias our judgment." Launch controllers will assemble early Friday morning to power up the rocket and load propellant into the fuel tanks of both stages, but Musk would not discuss the exact timing of those events. The Falcon 9 will take off and turn east-northeast from the launch pad, breaking through the sound barrier within about a minute. Consuming kerosene and liquid oxygen, the first stage's nine Merlin engines will produce a million pounds of thrust for nearly three minutes. "Every time I think about the rocket, I sort of cycle through all the places where I think things can go wrong," Musk said. Two of the Merlin engines will be ordered to shut off about two-and-a-half minutes into the flight to keep the rocket under tight acceleration limits. The other seven engines will turn off about 20 seconds later, if all goes as planned. Engineers designed the first stage to overcome an engine failure at any point during its burn and still accomplish its objectives. "Stage separation may be sort of the scariest moment," Musk said. "Stage separation and second stage start, that's probably what I worry about the most." Parachutes aboard the Falcon 9 first stage should deploy to slow the vehicle's fall back into the Atlantic Ocean. The Freedom Star recovery ship, normally used to retrieve space shuttle solid rocket boosters, is on station off the coast of Georgia to pick up the first stage. The second stage should light its single Merlin engine a few seconds later. The upper stage powerplant is specially-designed to fire in space. Musk said the second stage will fire for a few minutes before reaching a 155-mile-high orbit inclined 34.5 degrees to the equator. The launch will be complete between eight and ten minutes after launch. "Given this is a test flight, whatever percentage of getting to orbit we achieve would still be considered a good day," Musk said. "I think, even if we prove out just that the first stage functions correctly, that's a good day for a test. It's a great day if both stages work correctly." SpaceX is not releasing specifics on the launch countdown or flight timeline for Friday's launch, citing the desire to keep the information out of the hands of competitors. Musk told Spaceflight Now on Wednesday he did not want SpaceX's enemies to have a score sheet for "nitpicking" the flight. Friday's launch carries a lot of risk for Musk and could open the company to even more criticism from members of Congress and other opponents of the White House space policy, which would overhaul NASA's approach to human spaceflight by turning over flights to commercial management after the space shuttle's retirement. "As I was driving up this morning, I looked over and saw a mock-up capsule sitting on top of the Falcon 9, and I kind of imagined what it would be look like to be driving up there and putting people on top of it," Bowersox said. "I got some goosebumps from that." 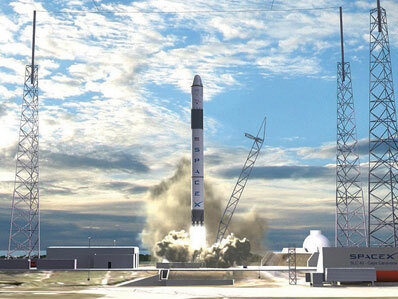 SpaceX contends the Falcon 9 rocket and Dragon capsule could be ready for human passengers by 2013, if NASA awards a contract for the work this year. "I feel sort of like a political punching bag or whipping boy," Musk said. "The opponents of the commercial approach have taken a very calculated strategy of attacking SpaceX while ignoring the Atlas and Delta rockets that are also commercial and have had now, I think, 31 or 32 consecutive successes." "Tomorrow's launch should not be a verdict on the viability of commercial space," Musk said Thursday. "Commercial space is the only way forward. If we go with super-expensive government developments, in the absence of some massive increase in the space budget, we will never do anything interesting in space." Alexander, who leads the commercial industry's leading advocacy group, said SpaceX is doing everything they can to downplay expectations for Friday's launch. "I don't think they can do enough," Alexander said. "I think they're doing all that they can, but these things have a way of having a life of their own. And because commercial is very much the focus of debate in Washington, their launch takes on added significance." Lost in the debate is the presence of more established companies like United Launch Alliance, which oversees Atlas and Delta rocket flights, and Orbital Sciences Corp., SpaceX's main competitor in the market for cargo services to the space station. "When it comes to the commercial crew activity that everybody's talking about, what's missing from most of the public discussion is the Atlas 5 is the rocket of choice for many competitors in the field," Alexander said. "That Atlas 5 has flown 21 or 22 times successfully in a row. When we look at SpaceX, they are achieving quite a lot and should definitely be applauded for it, but we have established companies with existing rockets ready to be used for putting people on top." For Musk, it's full steam ahead for Friday's launch, no matter the risk. "I think we're probably three-quarters likely to succeed," Musk said. "I hope that space favors us tomorrow and we're in the right three-quarters of that probability."